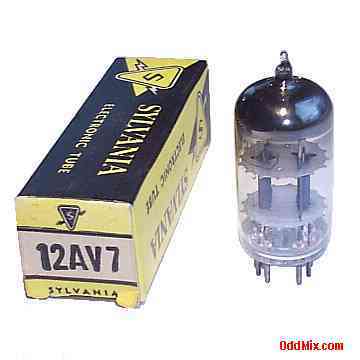 This is an original Sylvania 12AV7 Medium-Mu Twin Triode electronic vacuum tube. This tube was developed for use as a push-pull amplifier, first stages of audio-frequency amplifiers, resistance coupled amplifiers in ac/dc radio equipment. Also useable for multivibrators or oscillators in electronic instruments. It is a good general purpose dual triode replacement. This vacuum tube is new, unused, boxed, excellent condition. Useful for antique radio restoration projects or to set up a private vacuum tube museum. First come first serve, only one rare, historical vacuum tube available!